I've been trying to create a simple build script that would build a simple solution for a simple language. However the dependency system totally eludes me and I keep getting errors that I simply cannot make sense of. I already read Getting the dependencies right, but it just explains the dialogs without getting into much detail on why you actually need 4 types of dependencies and into which of the 4 dialogs you have to put your dependencies on which occasion (let alone the fact that you have dependencies on the module and the solution level which seem to be related to each other). So here's what I did so far. 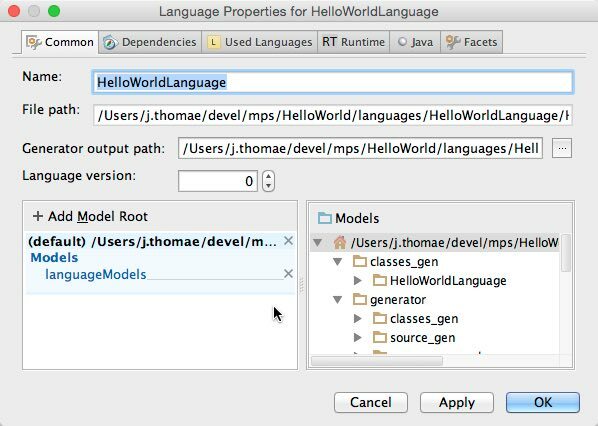 I created a "Hello World" language which just has one concept and builds a java "Hello World" from it. 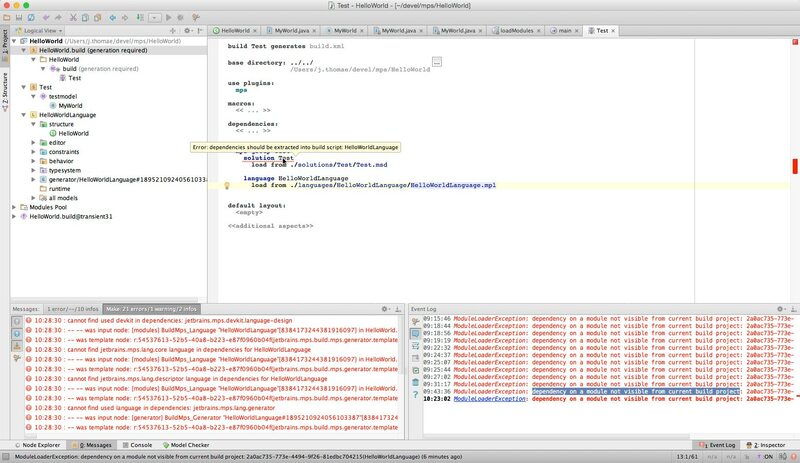 Then I created a "Test" solution which just creates an instance of the one concept of my "Hello World" language. Finally I added a "Hello World.build" project, where I wanted to create a build script for the test module, so I can build a sample hello world from the command line with ant. This is already confusing me. I added the language to "Used Language". Why do I need to add it to "Dependencies" as well? If I use a language it's implicitely a dependency. 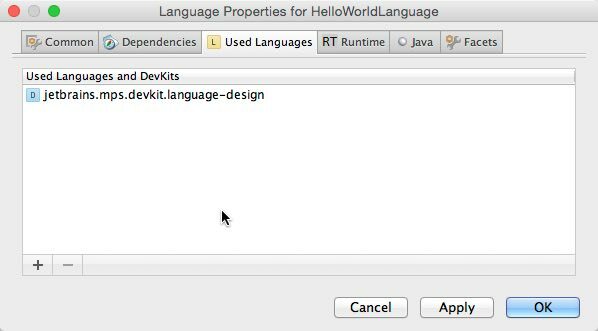 And even more confusing is, that when using the "jetbrains.mps.devkit.language-design" language in the "Hello World" language I don't need to add this to the "Dependencies" tab of the language and it still works. So, well, that issue solved, moving over to the build script. I created a simple build solution with the wizard, removed the generated file for the IDEA plugin (as I just want to build that "Test" solution and don't want to create an IDEA plugin). 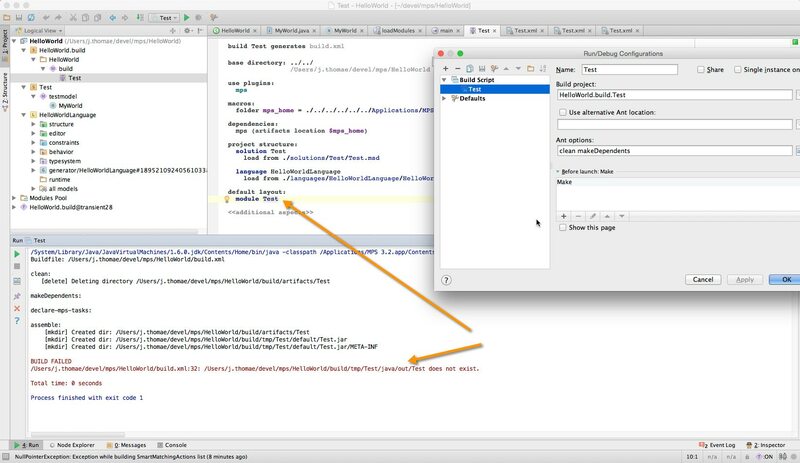 Then I added a new build script from scratch following the instructions given in "Build Language". So I just changed the path to be the root of my project, and then added the mps plugin and a mps group with my solution. 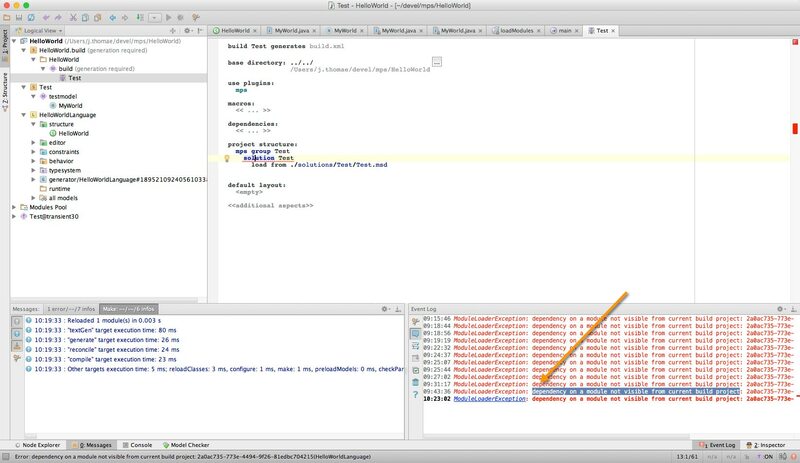 This yielded an error "dependency on a module not visible from current build project". So i thought, okay, maybe I need to add the language as well and I did it. 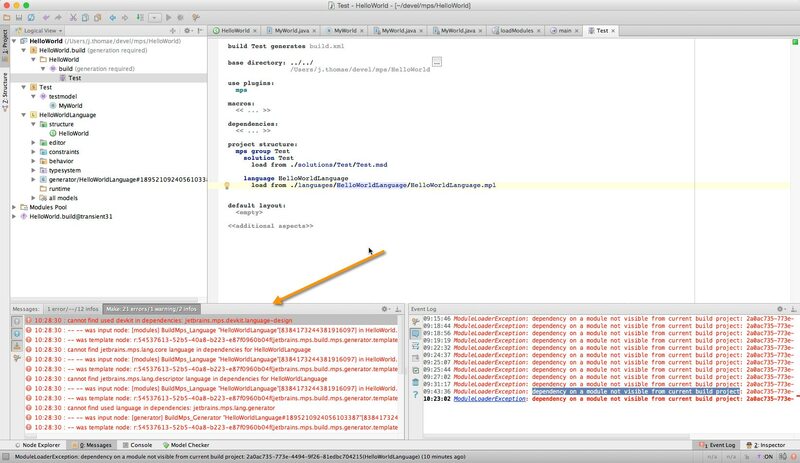 This yielded another error "dependencies should be extracted into build script". In the dependencies of the "Hello World.build" solution (but according to the build language description the dependencies are extracted from the files of the things to build, so I shouldn't add them there either). In the dependencies section inside the build file (but no example shows such a thing, so that might not be the way to go). 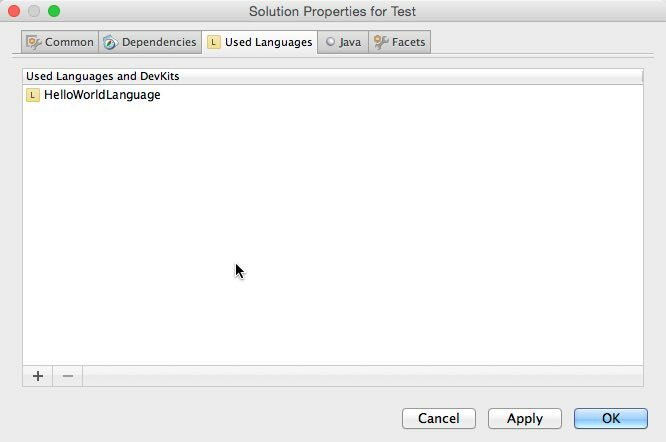 Why would I need to specify a used language in the "dependencies" section again in my Test-solution? Are there any hard and fast rules for dependencies, like "if you want to use a language in a solution put it here and there", "if you want to use a jar, put it here and there", etc.? Why am I getting these errors for the build script and how could I fix them? admittedly, this is quite an involved topic. 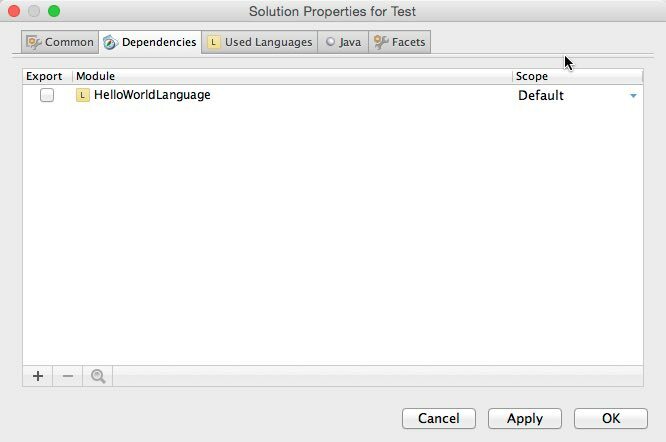 First, you should have added a "Dependency" of the sandbox solution on "JDK", not on the "HelloWorldLanguage". 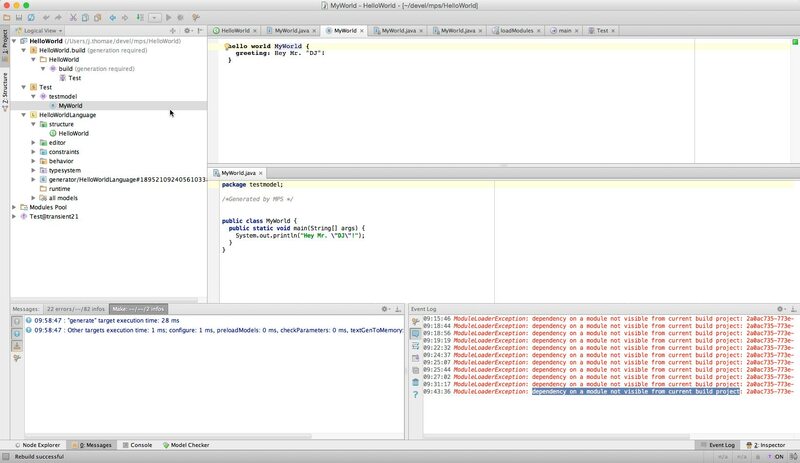 Since your sandbox models get translated into Java, the JDK classes must be available for the generator as a dependency. Second, it seems you have been too aggressive removing dependencies from the build script. You should have a dependency on "mps (artifacts location $mps_home)". I hope this helps shed some light on the dependencies in MPS. thank you for your suggestions, that at least made the project compile. However I still fail to get a proper jar from my Test solution. I tried entering "module Test" in the "default layout" section but that just gave some error about missing sources when running the ant script. 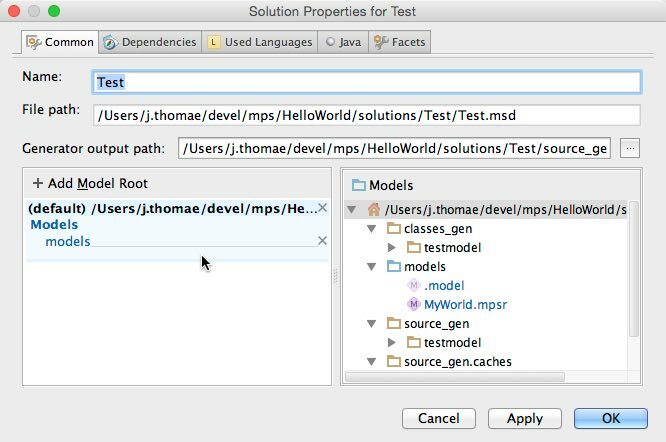 So I tried "jar" containing "compile output of <Module>", however the "Test" solution is not given as a proper option for "compile output of <Module>". Is it actually possible building a solution into a jar (e.g. i want a jar of the created HelloWorld class) with BuildLanguage? 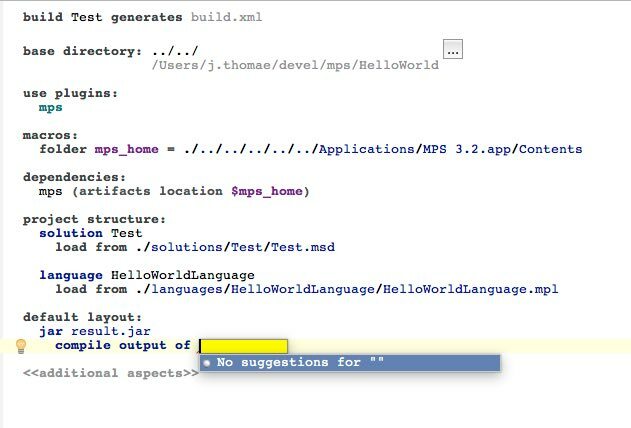 The Build Language description only mentions IDE plugins and standalone IDEs, but I actually want to create a plain jar library. Awesome, that works. Can't believe I missed that. Now that you state it it's totally obvious. Thank you very much, Vaclav! You are welcome, Jan. Clearly there are places where MPS should be more intuitive.